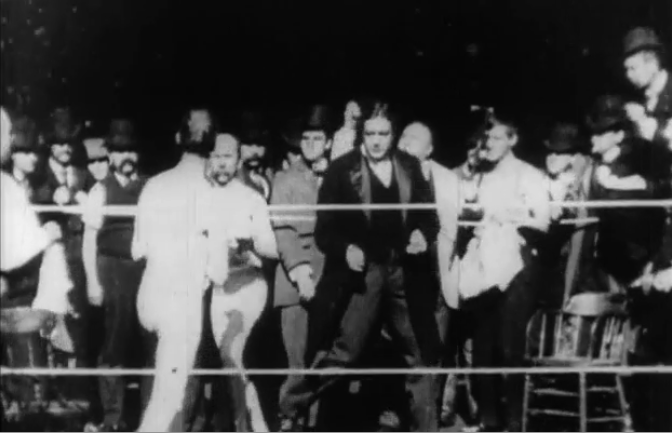 This is another quick round of a boxing match, which I assume would have been released along with other rounds, for viewing on a Kinetoscope in sequence. The fighters in this match are short – both noticeably shorter than the referee in the ring, and seem to be quick and determined to get as many hits in as possible before the camera times out. We see the end of the round and one of the fighters returns to his corner and gets fanned by a towel. There are a number of spectators in the background, and one gets the impression that this fight was quite an event, although we are still dealing with the small area of the Black Maria. The fashions are interesting: both fighters sport long mustaches and the ref is in an elaborate evening coat, with a style that reminds me of Severus Snape. Many of the spectators wear stove-pipe hats.